Throughout these Mac 101 lessons I’ve made references to your user folder, your account, and Administrators. And it’s possible that you’ve taken it on faith that I’ll explain what these things are and how they fit into all that is the Mac OS. Now is that time. Mountain Lion, as was every other version of OS X before it, is a multiuser operating system. Think of it this way: You have a house and within it there are rooms for you, your mate, your daughter, and your son. Each room is arranged and decorated by the person who inhabits it. All your stuff is in your room and when you close the door, the other people living in that house have no idea what you’re doing with your stuff. Now replace “house” with “Mac OS” and “room” with “user” and you’ve got the idea. You can have multiple user accounts on a single Mac, and each user has access to the applications on that Mac as well as their stuff—documents, movies, music, and so on. But like a family living in a house, in this multiuser operating system some users have more power (or privileges) than others. Mom gets to tell Sis when to go to bed. Sis tells little Biffy that he’s a gross little pig. And Dad gets to sit on the couch and spend his leisure time watching men bashing into one another and courting concussions. Let’s walk through the different kinds of users that can inhabit your Mac along with the powers they possess. Start by launching System Preferences and selecting Users & Groups from the System area. On the left side of the resulting window, you’ll see a User pane that lists any users currently configured on the Mac. By default you’ll see two—your user account, which will appear under the Current User heading, and Guest User, which appears below Other Users. By default, the word Admin will appear under your username. Let’s talk about that. Administrator: An Administrator user has the most control of all the default user accounts. This user can create other user accounts (as well as modify and delete them), install new software that everyone on the computer can use, and unlock locked items (such as certain system preferences) so that they can be edited (or in the case of locked files, deleted). 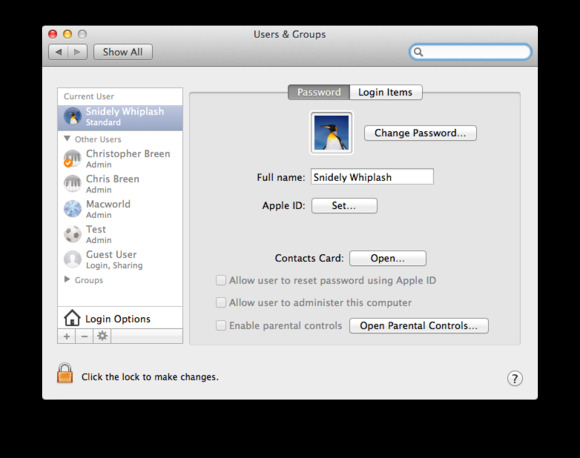 By default, when you first create an account on a new Mac, you create an Administrator account. Standard: Standard users can install software only for their own account and modify user settings that apply only to their account (the desktop pattern, for example). These users can’t add or modify other user accounts. Managed with Parental Controls: This is an account created by an Administrator that’s limited for the protection of the intended user (largely created for a young child who you don’t want visiting unsavory websites or communicating with strangers). I’ll devote a future column to Parental Controls. Sharing Only: This account is intended solely for those who want to log into your Mac from another computer. Once they do, they have access only to your shared folders and shared screen. (See Exploring the Mac’s Sharing Features.) You can’t log into a Sharing Only account from the Mac that bears it. Group: This is another kinda/sorta account that’s a bit like a Sharing Only account. The difference is that the people you allow to access shared items on your Mac must have user accounts on that Mac. I’ll explain this in greater detail shortly. A friend has come over and she’d very much like to use Safari to check her email. You don’t want her nosing around in one of your accounts so you tell her to click the Guest User account on the login screen. She does so and is presented with the standard Mac interface. She can then launch Safari, travel to wherever it is she views her webmail, and then log out. Any files she’s created will be automatically deleted as soon as she logs out. That way, when the next “guest” logs in, they will see no traces of your friend’s activities. With the Users & Groups system preference open, click the lock icon in the bottom-left corner of the window. Enter your Administrator’s username and password and click the Unlock button. Click the plus (+) button at the bottom of the user list and a sheet appears. In that sheet is a New Account pop-up menu where you can choose the kind of account you wish to create. For now, let’s choose Standard. Enter the full name of the person whose account you’re creating—Snidely Whiplash, for example. 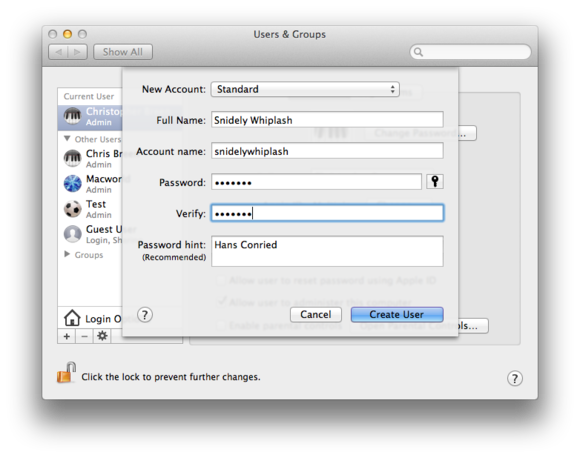 Click in the Account Name field and your Mac will create an account name for you—snidelywhiplash, in this case. You can change that name if you like. Then enter and verify a password for that user. (Don’t use the same password you use for another account, including your own.) Enter a password hint if you like (Hans Conried) and click Create User. That account will now appear in the user list. With that account created you see that you have a few options. You can, for example, change the picture associated with the account by clicking the current picture and choosing a new icon, selecting a recent icon, or clicking Camera and taking a picture that will be associated with the account. You can also set or create an Apple ID for the account. That allows the account to work with the iCloud identity associated with it. You can additionally choose to allow the user to administer the computer (which changes the account’s status to Administrator until you disable this option and turn it back into a Standard account). And you can enable parental controls for that user (which, again, I’ll discuss at length in a future column).